Find helpful information of general services we offer. Maps, Notary Services, County ID Cards, Veteran's Services and more. Subdivision Maps filed with the County Clerk are available for public inspection. 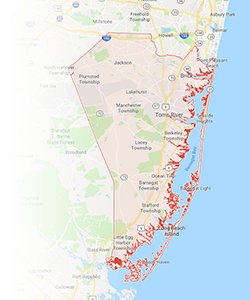 Tidelands & Wetlands Delineation Maps prepared by the New Jersey Department of Environmental Protection are also available for inspection. Individuals who wish to become a Notary Public may seek the assistance of the County Clerk during the application process and have the oath of office administered at all 4 of our locations. You can now apply to be a Notary Public online, download a Notary Public Application, or pick one up in the Clerk's office. Upon receipt of your application and check we will forward it to the appropriate member of the State Legislature for endorsment. After receiving your commission back from the State, please come into the Court House, Room 114 or any of our other locations, within 90 days of when you applied for your Notary to take the Oath of Office. The fee for this is $15 in check payable to: Ocean County Clerk or cash. We also accept Visa, Mastercard or Discover for the $15 Ocean County Clerk fee only. Did you move or change your name? If you wish to change your name and/or address download the Notary Public Name and/or Address Change Form. • Applying for a NON-Driver Photo ID Card at any NJ Motor Vehicle Commission Agency. Honorably discharged veterans can now obtain a free photo ID Card from the Ocen County Clerk's Office that makes it easier to take advantage of a wide variety of veterans discount programs. The Cards can be used in a variety of locations, including at local businesses that provide discounts to veterans. With this card, there is no doubt about the holder's veterans status. The Veterans ID Card Act was signed into law by Governor Christie in August and is especially important in Ocean County which is home to more than 68,000 veterans than any other county in New Jersey. Veteran must provide his or her DD-214 Discharge Papers at either the County Clerk's Office on 118 Washington Street in Toms River or The Southern Service Center at 179 South Main Street in Manahawkin Monday - Friday between 8am - 4:30pm. ID Cards are also available at the County Connection at the Ocean County Mall at 1201 Hooper Avenue in Toms River. 7 days a week, mall hours. NOTE: The ID Cards are not designed to replace federal veterans identification needed to access government programs such as VA hospitals and clinics. Honorable Discharges form DD-214 previously filed with the County Clerk are available upon request. Veterans residing in Ocean County may apply for a Veterans Peddlers License. To schedule a Wedding Cermony at the Courthouse, please call Judge Ford's Chambers at (732) 929-2176.